I have been wanting to make a growth chart FOREVER. School is now in session, and fall is most definitely painting season, so I went for it! 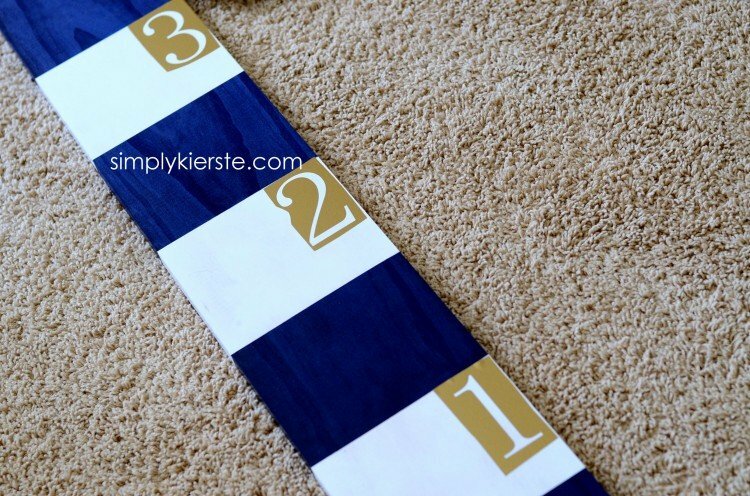 I love stripes, and I thought it would be a really fun way to divide the board into sections. I used our playroom colors, and I LOVE LOVE how it turned out! The truth is, stripes can sometimes be a little tricky. There is nothing worse than paint leaking out under your painters tape and creating an uneven line! It’s happened to me when painting walls and other projects, and it makes me crazy. That’s why we LOVE FrogTape painter’s tape at our house. Seriously, it creates the most clean and crisp lines–it makes me so happy! 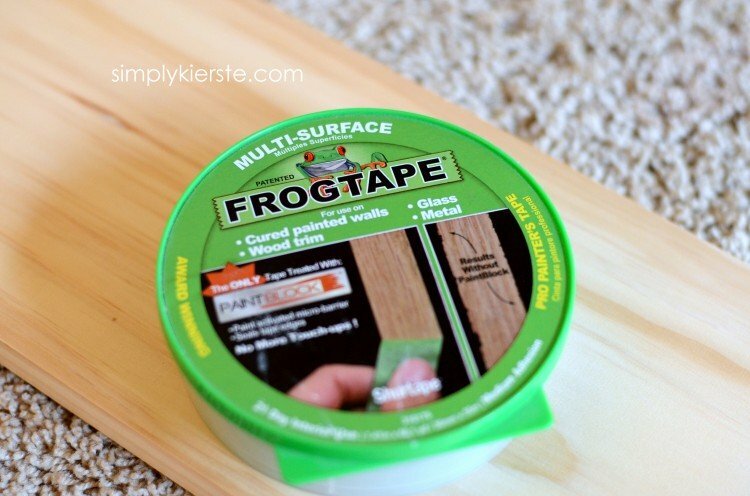 Frogtape® Multi-surface is a medium adhesion painter’s tape designed for use on a variety of surfaces including unfinished wood, metal, glass, carpet and stone. FrogTape® is the only tape treated with paint block technology, a super absorbent polymer that reacts with the water in latex paint and instantly gels to form a micro-barrier that seals the edges of the tape, which helps prevent paint bleed. Isn’t that lovely and amazing? 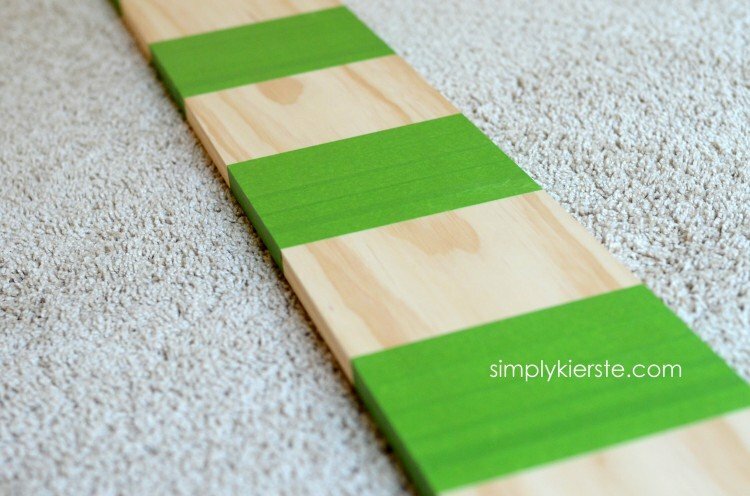 ☺ It makes cute stripes painting projects that much easier, along with any other painting projects that require painters tape. 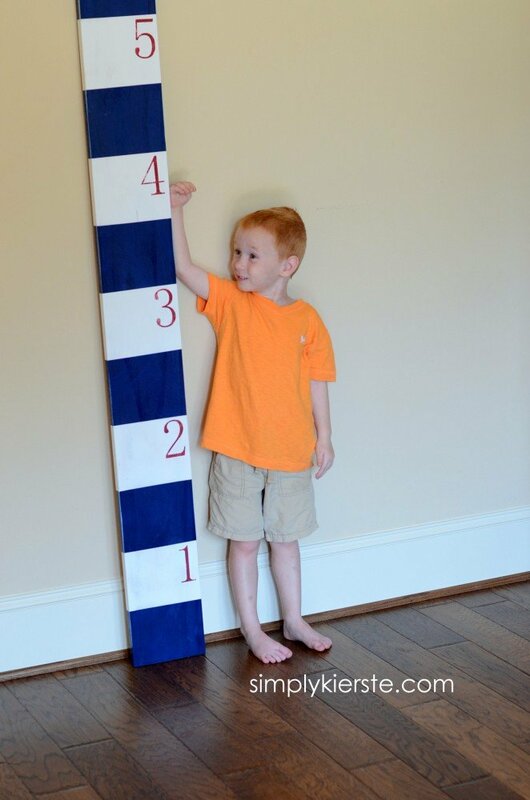 It helped me to create the PERFECT stripe on my growth chart, and best of all, it was EASY!!! This was such a fun and easy project…let me show you how I did it! 1. 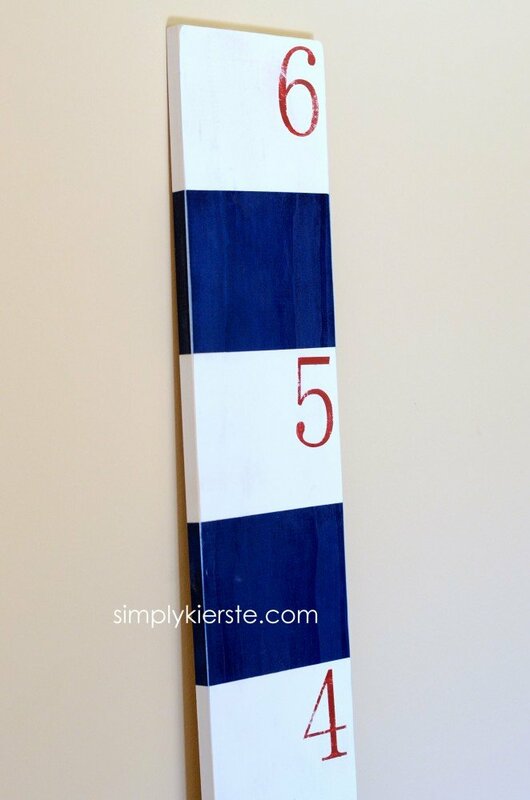 I wanted 6 inch stripes, so it would be exactly even on the 6 foot board–with 12 total stripes. 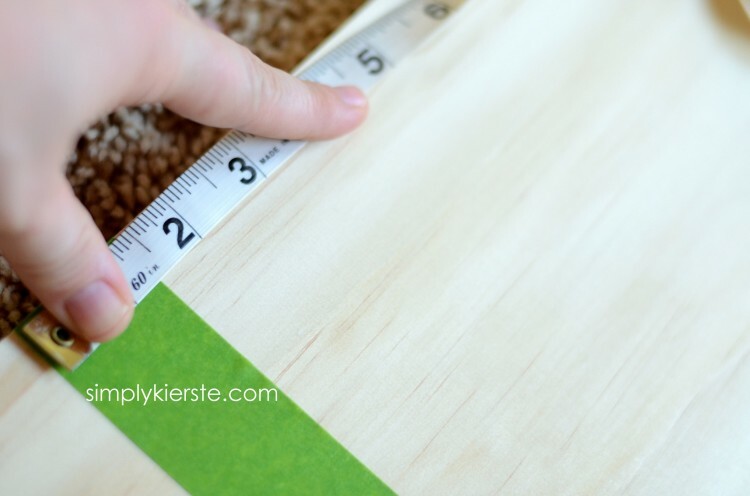 Using a sewing tape (I think it’s easier to use on projects like this), I started from the bottom of the board and measured up 6 inches. I put the bottom edge of the FrogTape® at the 6 inch mark, and filled the space with strips of it until I hit the 12 inch mark. I skipped the next 6 inches, leaving it bare, then repeated the tape process for the following 6 inches. I repeated this until the whole board was done. 2. I painted the bare wood white, and let it dry completely. I decided on white, not only because it’s one of the colors in our playroom, but because it would really make the numbers pop, and I wanted them to show really well. 3. When the paint was really dry, I applied the FrogTape® directly over the white sections I had just painted, BEFORE I removed the tape that was already on there. I found this method to be really helpful to line up exactly where my two colors need to meet, with no overlap. Once I had taped over all the painted white, I removed the first set of tape. That left me with bare wood sections, and the taped over white sections. 4. I painted the now bare sections navy blue. Once it was completely dry, I removed the tape. Uh-mazing!!! You have to see these lines! Totally perfect–even on wood, which can sometimes be difficult to stop paint leaking through, due to a typical uneven surface (even after sanding). 5. I cut out numbers 1-6 on my Silhouette, then used the negative space as a stencil. I painted the numbers red, let it completely dry, then removed the stencil. 6. I sanded the edges of the board, and top of the board to give it a slight distressed look, then wiped off the excess dust. Ta-da!!! 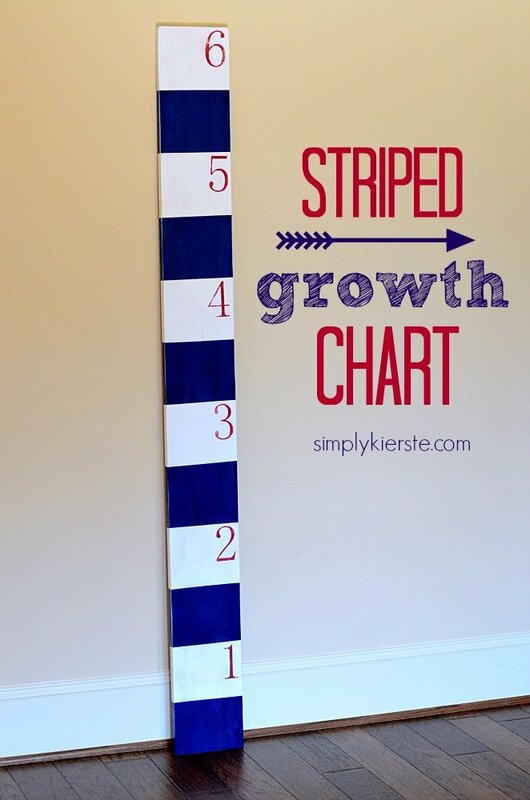 A totally cute striped growth chart!!! You can find FrogTape painter’s tape at participating Lowes and Walmart locations, and all Menards, Ace, Sherwin Williams, True Value and Do It Best stores across the United States. I bought mine at The Home Depot, so you can also check there! FrogTape® is also on Twitter, and you can follow @FrogTape for tons of creative inspiration! Super cute! What brand & color of blue did you use? I adore that you can still see the wood grain through that part! Kierste! I LOVE this!!! You did a fabulous job!! I just may give a try! You always impress! I print out the numbers in vinyl, then remove the actual number 6 (what you would use if you were using the vinyl), leaving the negative space including the center of the 4 and 6 (what you would normally throw away). I apply the transfer paper, then when I place the vinyl stencil on, it keeps it all together so I can paint it! Does that make sense? This is so nice! Where do you plan on marking the height? Hi, Jess! I mark the height along the right side!